DP rearsets install instructions anyone?? Take the 3 bolts out of the clutch slave and slide it off. It will then give you room to get to the shift rod bolt. How the hell do you get that linkage off? The screw holding the linkage to the trans is behind the clutch fluid intake, and it's all too tight to remove linkage at the spline itself. I'm boned right now. It's a lot easier if you remove this bolt first. Then remove the shifter followed by removing the 2 bolts that mount it to the frame. Loosen the pinch nuts on the shift rod to give it some rotation. 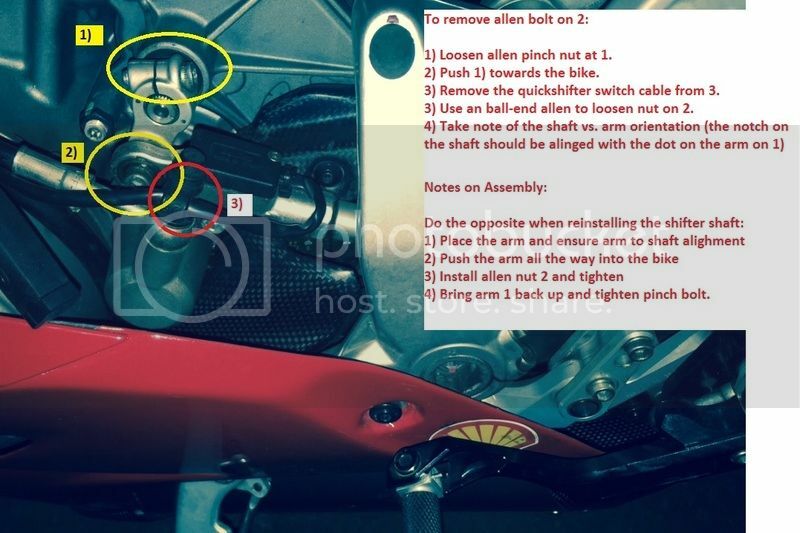 This will allow you to rotate the base away from the swingarm so that the shift rod bolt is facing up giving you more room for an allen key. Last edited by RRnold; May 3rd 2015 at 10:04 PM. Loosen the pinch bolt on top of the lever, then slide the linkage in (towards the trans). That should clear up some space between the clutch line and the bolt to get a ball end Allen key in there. By this time you should also have the linkage disconnected from the stock lever as posted above. Last edited by BadBoyBeltran; May 4th 2015 at 03:23 AM. This is a better solution than my recommendation. I was afraid of the clutch fluid leaking. I didn't want to bleed the clutch if I didn't have to. I'm gonna assume that it will come off with the fluids intact. Yeah, did that - it's the long aluminum linkage that I can't get off (I can't disconnect from the other side). Thought about cracking open the banjo on the clutch line just enough to rotate it 90 degrees, so I could get an allen key into the screw behind it. To get to the Allen behind the linkage, you loosen the adjustable end on the pedal end of the shifter to be able to rotate it. You can also rotate it right after the shift switch. You have to replace that arm anyway. I was able to stick a ball end Allen in there after pushing it in. Maybe yours is connected different from mine. I think you're talking about the other end of the linkage. I'm talking about the allen screw immediately behind the clutch slave. Are we talking about this bolt? You might have to remove the QS switch if it's in the way. Sorry, I didn't see you were going GP. Since you're replacing the shift rod, you're going to have to remove the clutch slave. and the C/S line is blocking the shift rod bolt. It was a lot easier installing the Lightech's since it uses standard shift DQS and mounts the shift rod higher above the pivot point on the baseplate making it GP shift. S'all good. Pair of vise grips on the aluminum linkage did the job. If I ever revert to stock and sell, I'll need to replace it, but for now... Meh.